NASA scientists and administrator Jim Bridenstine, the former Oklahoma congressman, weren’t the only ones mourning this week’s formally-declared death of Opportunity, the rover sent to Mars 15 years ago. So was Oklahoma congresswoman Kendra Horn, who chairs a House subcommittee on space exploration and technology. 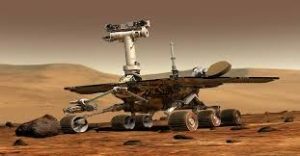 After NASA said “Oppy” as it was nicknamed no longer responded to messages from earth, the scientists said goodbye to the rover. She chairs the House subcommittee on Space and Aeronautics. The robot set a huge number of records as it traveled across the Martian surface, eventually travelling some 28 miles and lasting far longer than any other Mars lander. It discovered that water once flowed on the planet and lit up the world with the possibility that it might once have been able to support life. But in June – after sending messages back to NASA that indicated it was getting dark and its batteries were running low – the rover went silent. A vast dust storm had covered the entire planet and is thought to have covered up the solar panels that provided Opportunity with its power, leading it to shut down. NASA sent more than 1,000 messages to try and wake up the rover and get it working once again. But its last try was sent on Tuesday evening and went unanswered, leading the space agency to declare the rover dead. It brought an end to 15 years of exploration over the red planet. Opportunity arrived at the beginning of 2004 alongside an identical twin known as Spirit for a mission that was only intended to last just three months and travel only 1,000 meters.